I first discovered a coffee tonic when I was visiting Zurich, Switzerland with a few girlfriends. We were walking down a quaint little street, stopped into a coffee shop and my friend ordered a coffee tonic. It sounded so interesting and I was intrigued since these coffee tonics were popular drinks over there! 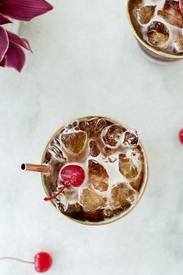 A coffee tonic is pretty much like an iced, fizzy coffee drink that’s refreshing and has bubbles! They’re incredibly easy to make at home too.